It's taken me three months to do it, but finally, at long last, Boozehound Unfiltered is making a triumphant return to the blog- and this time, we're back with bourbon! 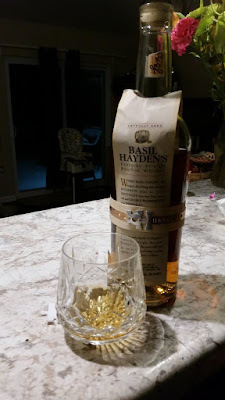 Basil Hayden's is something I've had before- but I think it was one of those Boozehounds that got lost in cyberspace, because I can't find any record of reviewing it anywhere. A Valentine's Day present from the Missus (she got flowers and a nice Moscato, I got the man equivalent: bourbon) I was eager to get into it and see if it was as good as I remembered it being and happily, it was! As with all these bourbons, Basil Hayden's got started in the late 1700s, emigrating along with other Catholics from Maryland to the west- according to the Wikipedia page, he helped found the first Catholic Church in Kentucky and his family roots can be traced back to the Norman Conquest in England- so this is a family with a rich and proud history. This whiskey actually has a distant relative in Old Grand-Dad, whose label actually features a likeness of Basil Sr. (The Old Grand-Dad distillery was founded by Basil's grandson, Hayden.) So I guess I know where my next bourbon is going to come from- have to see if the Grandson is as good as his forebear. Let's talk some bourbon, shall we? Palate: You get a rush of the fruit up front and then the spice creeps in- cinnamon is prominent- though peppermint is in there too. Viscosity is good. It's not weak or watery- it's not too heavy and syrupy either. Finish: Is nice... it's not harsh at all and if there is, it's brief enough not to both you in the slightest. This is an excellent finish.